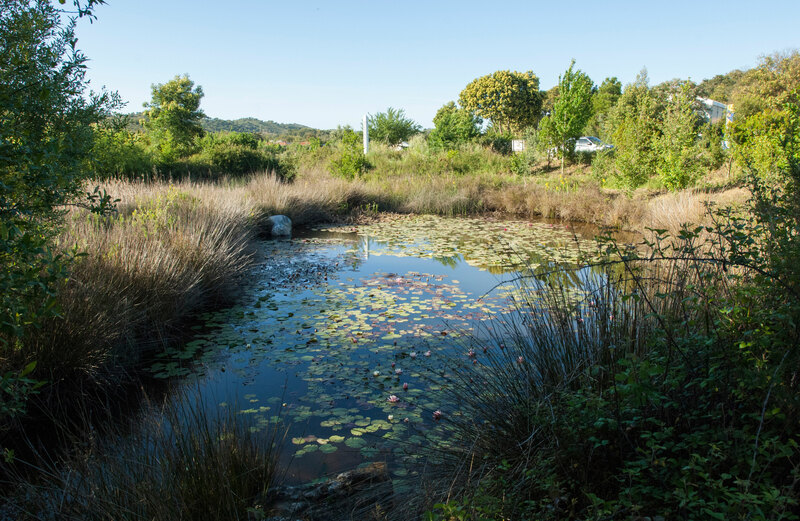 The focus of Tamera´s ecological work is on building the Water Retention Landscape as a far-reaching holistic and regenerative approach for ecosystem restoration. It’s a model for natural and decentralized water management, a basis for reforestation, horticulture and agriculture in regions threatened by desertification, and is part of a comprehensive model for sustainability on a large scale that includes water, food, energy and community building. We humans have the knowledge of how to transform deserts and semi-deserts back into living landscapes traversed by fresh spring water streams. In most cases desertification isn’t a natural phenomenon but the result of incorrect water management on a global scale. Deserts don’t arise because of a lack of rain, but because humanity treats water in the wrong way. Our landscape in the Alentejo for example is considered an arid region – and yet there’s an average annual precipitation of 700mm. This amount of rain would be enough to supply the population of the whole region with an abundance of water for drinking, household and agriculture. But instead it runs off unused and causes damage. The fertile soil washes away, the Earth under the foundations of bridges is washed away, and many roads, villages and towns are flooded. In a healthy biotope, the topsoil layer functions as a balancing sponge that absorbs the rainwater into the Earth body. Especially over the last decade, erosion has progressed so rapidly and extensively that we can speak of a global disaster. The natural topsoil layer has disappeared from a large percentage of the planet’s surface – which is why the Earth body has largely lost the ability to absorb rainwater. Here in Portugal, we have a lot of rain in winter, but dry summers. Only a few decades ago, the Alentejo was a region where the streams flowed with water all year round, even in summer. Today the streams swell only during the rainy season and afterward they become dry again. The system has fallen completely out of balance. We find similar situations in all climate zones worldwide. 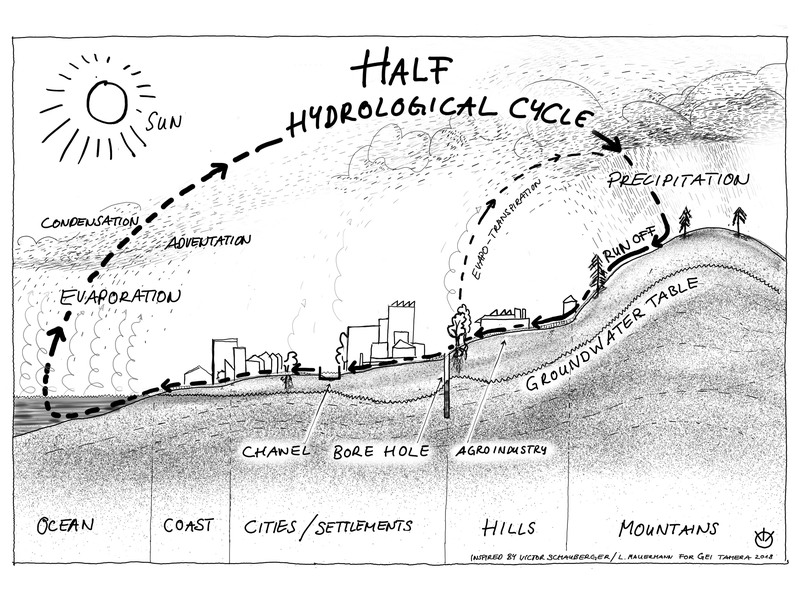 We call this phenomenon the “half water cycle.” Almost everywhere we see widespread flooding and landslides on one hand and massive fires on the other hand with catastrophic consequences for humans, infrastructure, animals and nature. People speak of natural disasters, but in reality they’re human-made. This is why we mustn’t delay ourselves by developing ecosystems which create a thin layer of topsoil after only thirty, forty or even more years. We need this balancing sponge-effect sooner. To complete the water cycle again we needed to find a way in which the Earth could absorb the water despite the missing topsoil layer. 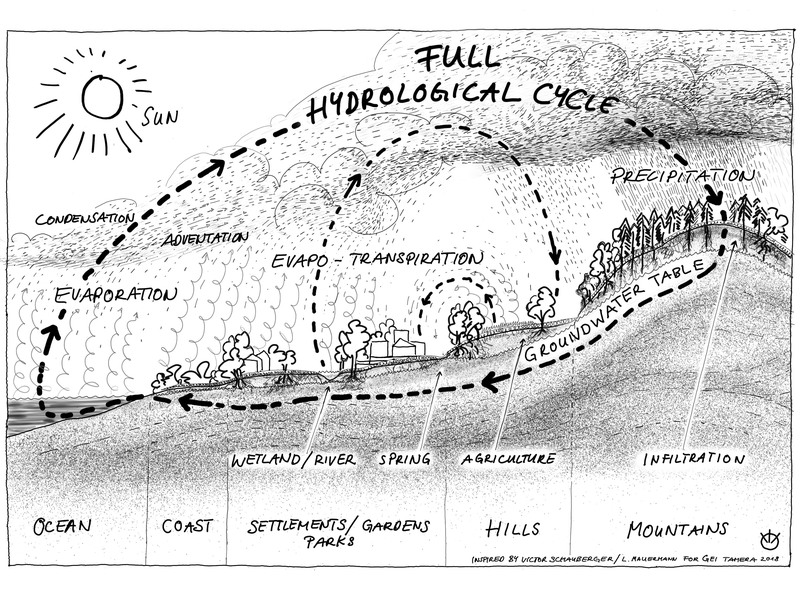 This is how the idea of Water Retention Landscapes developed: these are systems for restoring the full water cycle by retaining rainwater in the areas in which it falls. There are plenty of ways to hold the rainwater on the land that can be used in various combinations. 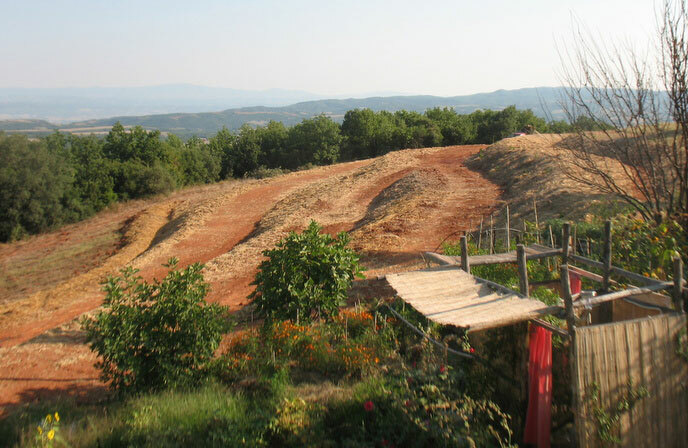 Creating retention areas can involve building check dams, swales, terraces, deep plowing along the keylines or using land stewardship techniques such as reforestation, organic farming and special pasture management, e.g. Holistic Planned Grazing. The basic principle of a Water Retention Landscape is that no rainwater should run off, but rather infiltrate into the soil where it falls. The absorbed rainwater goes into the aquifers and is purified, energized and mineralized. All outflowing water is spring water, steadily supplying humans, flora and fauna with liquid life – even during long periods without rainfall. 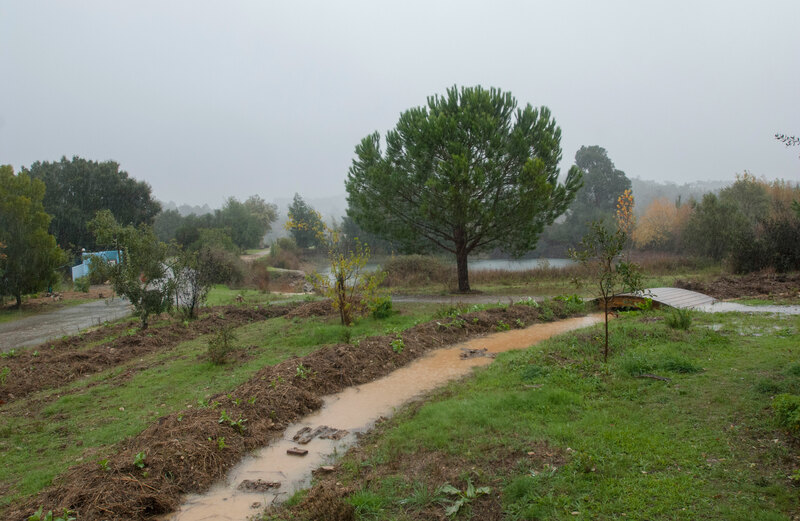 In Tamera, we have created a series of interconnected retention areas (from pond-sized to lake-sized), in which the rainwater can collect behind a dam constructed from natural material. The retention spaces themselves aren’t sealed with concrete or any artificial membrane, so that the water can slowly but steadily diffuse into the Earth body. The term “Water Retention Landscape” is always connected with the concept of healing nature. Building Water Retention Landscapes is an active and effective answer to the destruction of nature. This answer was developed in Tamera in intense cooperation with the Austrian Permaculture specialist Sepp Holzer and various visionaries and ecologists from around the world. Water is the missing link for reversing climate change. It’s possible to achieve water autonomy in our region and everywhere in the world. When restoring the natural water cycles, we take the first, indispensable step for restoring ecosystems and lay the foundations for self-sufficiency. Wherever you are, make sure rainwater doesn’t run off, but instead filters into the aquifers.